AGB Search is the only firm that specializes in all aspects of executive search exclusively for higher education institutions. Founded by the Association of Governing Boards of Universities and Colleges (AGB) in 2010, AGB has a unique understanding of the qualifications critical for effective higher education leadership. AGB Search is dedicated to client success and guarantee a smooth, effective search. 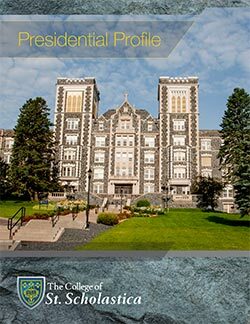 Its consultants will collaborate with the College to learn about what makes St. Scholastica distinct and to develop a thorough understanding of St. Scholastica’s needs and culture in order to identify the best pool of leadership candidates. St. Scholastica will work with lead consultants Dr. Loren J. Anderson and Shannon McCambridge, J.D. Anderson joined AGB Search in 2012 as a Senior Consultant following a highly successful career in the private, liberal arts and comprehensive university sector of higher education. Since joining AGB search, Dr. Anderson has completed over 20 searches for presidents and senior leaders, and has focused his practice mainly on private, faith-based, liberal arts colleges and universities in the Midwest. McCambridge brings many years of experience in higher education governance and employment law to AGB Search. Since joining the AGB in 2014, McCambridge has conducted many executive searches. The following is a sampling of the institutions she has represented: Golden Gate University, University of San Diego, Benedictine University, Marymount California University, St. Joseph’s College, and St. Catherine University.